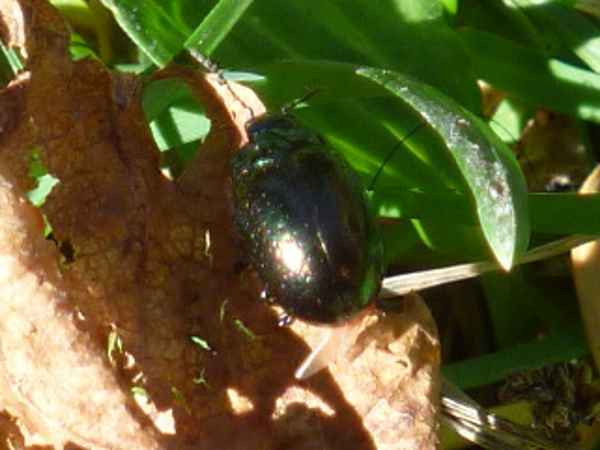 There are many kinds of beetles that you have in your garden, even though you probably won't see them much; many are nocturnal, trundling about all night, and creeping under a board or rock when daylight arrives. They can predate many other insects, even earthworms, other beetles as well as slugs and snails. 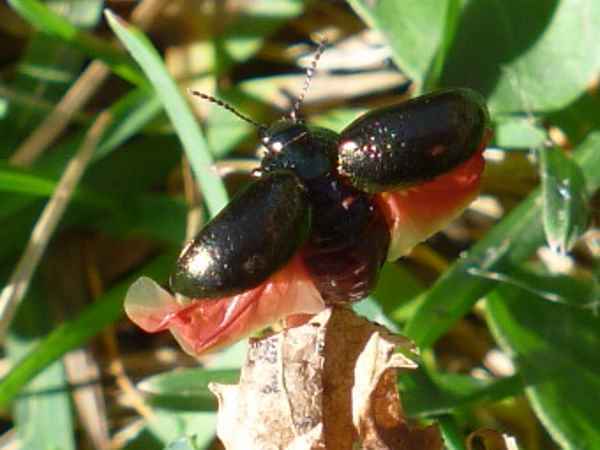 Depending on the type, some eat live prey while others, such as the Cadaver Beetle or Undertaker Beetle will clean up carrion. The Cadaver Beetle takes care of any dead carcases - even larger animals. They have the most amazing sense of smell, locating the dead body and flying to it. There, they burrow under it, eat their fill, and most likely lay some eggs. Although some beetles don't have wings, others do. They hide them inside the durable shell, and unfold them as needed. Some, like this Dogbane Beetle, have amazingly brightly colored wings, protected from the elements and brought out only for special occasions. Some, like the Bombardier Beetle have a tactic to ward off attackers; they stop dead in their tracks, crouch down with their front end, and stick their hind end up in the air. They have the ability to shoot out a chemical that is apparently quite repulsive, and gives them time to get away, while the attacker is getting their breath back. Most beetles are beneficial, spending their lives tracking down prey, cleaning up after after other animals, and general doing good deeds. Some beetles aren't as polite. 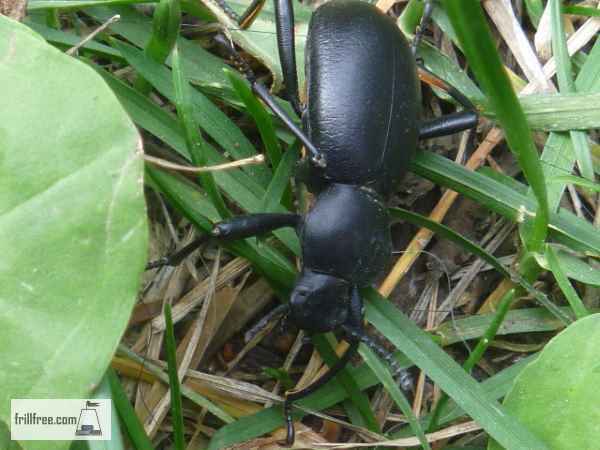 The Blister Beetle hangs around on alfalfa in particular, making a nuisance of itself when the fields are cut for hay. 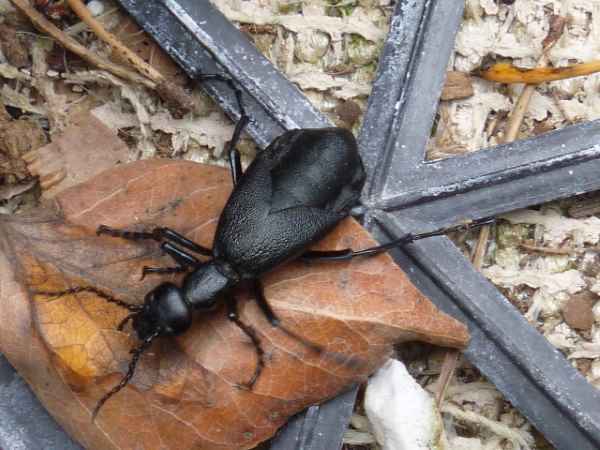 They are called 'blister' beetles for a reason; just touching them raises welts. Their other nasty habit is to wait for bees to land on the flowers for the nectar, attach themselves to the bee, hitch a ride to the hive, and wreak havoc there. 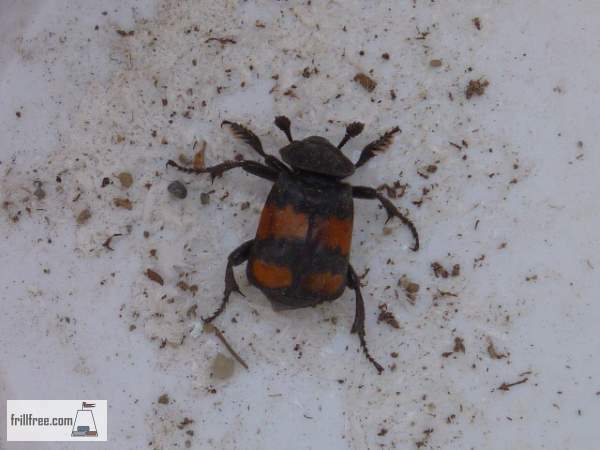 There are lots of different types of burying beetles, of the genus Necrophorus. They go by several names; cadaver beetle, sexton beetle, carrion beetle and others (all to do with their role in the cleanup crew). They are often striped orange and black.